We all received this one with our January Action Pack. Did you get the, "Huh? What is that exactly?" from your supplier? 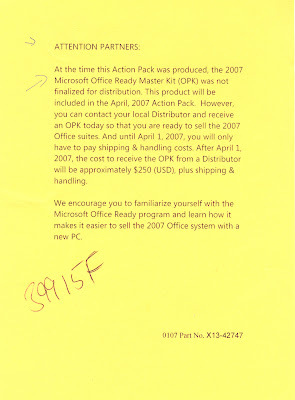 Note to Microsoft Partner Program: Next time you give us a little note like that, please put a part number for the product indicated so that it is easier for us to obtain it! It took a bit of hunting around to figure it out! Advice to System Builders: Pick up one or two extra copies for those "Just in Case" moments. Media can be damaged or outright ruined quite easily. It will save you quite a bit of coin in that event to have an extra!